Pablo Iglesias. Demotix/Hugo Ortuno. Some rights reserved.The significance of Syriza’s electoral victory for anti-austerity parties and politics across Europe is slowly, but steadily sinking in. The next showdown will be in Spain where local and regional elections are due on 24 May, and a general election will be held before the end of the year. An electoral victory of Podemos will signal that the hard line neo-liberal block opposing anti-austerity policies in the Eurozone has not succeeded in silencing the voices of the people. Even without an electoral victory though, Podemos have won: they have already changed the political terrain in Spain and beyond. Europe has been divided along an invisible, transnational frontier. Two camps, for and against austerity, rally their forces across national borders. Before, during and after the recent Greek elections, Spanish politicians went to Greece to rally support for their friends there, in the hope that this would in return help their own electoral prospects at home. The Spanish Prime Minister, the conservative Mariano Rajoy, went to Athens in support of his conservative counterpart, the now former Prime Minister Antonis Samaras. It is no coincidence that, after the Greek elections and during the negotiations with the Eurogroup, Rajoy and the Portuguese PM, Pedro Passos Coelho, have both tried their best to block any favourable agreement for Greece. The same gathering of forces is taking place on the opposite camp. Both the leader of Podemos, Pablo Iglesias, and the leader of Izquierda Unida, Cayo Lara, took the trip to Athens in support of Syriza before the election. Although they all agreed that ‘Spain is different’, they also tried to articulate the Greek election in a way that would play into their own hands at home. After the Greek elections, Pablo Iglesias did not waste the opportunity to remind Rajoy that the clock is ticking down towards the end of his government: ‘Tick, tock, tick, tock’. Given the size of the country, a Podemos victory in Spain would have a much bigger impact on the future of the EU than Syriza’s victory in Greece. The latest opinion poll from the CIS research centre shows Podemos at 24%, only three points behind the ruling conservative party, PP, and two points ahead of PSOE. In the latest Metroscopia opinion poll, published in El País, Podemmos and PSOE are tied at a little over 20%, with PP and the new kid on the block, the centre-right Ciudadanos, a few points behind. The results of the local and regional elections depend more on local particularities. Podemos will not run candidates everywhere, and, in some cases, a separate electoral alliance connected with Podemos, called Ganemos, will attempt to challenge the duopoly of PP and PSOE. The peculiarities of local elections were last witnessed in the regional election in Andalusia on 22 March were PSOE did relatively well (Andalusia is an old PSOE stronghold) and Podemos scored only 15%. If we are to believe the opinion polls, it is clear that the anti-establishment politics of Podemos might well win the elections. Although they are unlikely to win an outright majority, they have galvanised the opposition to the conservative government, while simultaneously challenging the parties of the old left. Although they have not yet fallen to the same depths, PSOE is in a situation similar to that of PASOK in Greece a few years ago. The party changed leader after the EU elections last May, but the position of the new leader, Pedro Sánchez, is precarious, and the person to watch is Susana Díaz, the head of the regional government in Andalusia, a PSOE stronghold. A poor showing in the local and regional elections on 24 May, and Sánchez is likely to be able to call himself ex-leader. PSOE is caught in a catch-22, damned if they do, and damned if they don’t. Through many years in government and collaborating with PP, they have come to be seen as part of the system – the caste, in Podemos’s discourse. The only way for PSOE to save themselves from the fate of PASOK is to stop being PSOE. But when trying a more populist appeal, they just reinforce the impression that Podemos is the real thing, and that they – PSOE – are merely a poor imitation. This is best exemplified when Sánchez took to sporting an open shirt and a small rucksack, and spent his first months as leader doing the rounds on the TV talk shows – while criticising Podemos for being populist. PSOE is trying to catch up, and their position after the general election is not going to be easy. They can enter into a grand coalition with PP, and risk electoral suicide. Or they can enter into a broad leftish front with Podemos, and risk being swallowed up by it. Similarly, Podemos have forced Izquierda Unida to rethink its role within the new political reconfiguration. Initially, Izquierda Unida picked up disaffected PSOE voters after the indignados protests in 2011, but they have been unable to respond to the success of Podemos. In the discourse of Podemos, Izquierda Unida are part of the old system, and local Izquierda Unida politicians have not done their party a favour by being involved in corruption cases. The party is in the middle of changing leaders, from the old-style Cayo Lara to the young Alberto Garzón. But the party is divided between purists, who insist on the importance of talking about class and capitalism, and those who, like Garzón, believe that it is necessary to build a broader front and appeal beyond the traditional Izquierda Unida voters. Pursuing the first strategy, Izquierda Unida risks oblivion; pursuing the second strategy, they risk being swallowed up in a popular front led by Podemos. Podemos’s populist left politics are similar to those of Syriza and a tried recipe for electoral success: creating a broad popular front by articulating an antagonistic frontier between the people and the system. In the case of Spain, the system is ‘the caste’, both political and economic elites, and Podemos present themselves as the only true medium of the voice of the people. Podemos have combined the ruthless top-down management of the party with the mass mobilisation of voters. The party has been centralised to such an extent that it is now run by Iglesias and a small circle around him. They appeal directly to voters via mainstream and alternative media, and they repeatedly articulate the discontent with the system, and the antagonistic frontier between the people and the caste. Without this, they would no longer be needed. Most recently, on 31 January, they arranged a big demonstration in Madrid. It is this sort of mobilisation of the masses that keeps alive the spirit of the indignados: the feeling among the population that things could indeed be different. 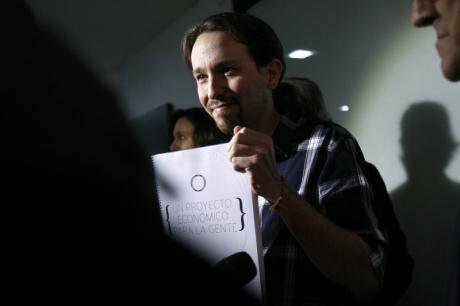 Podemos differ from Syriza in one important respect though: they shun the label ‘leftist’. While both parties want to be the party for everyone – the whole people – Syriza still wear its leftish credentials on the sleeve. This makes Syriza closer to Izquierda Unida, which also started as a coalition of small radical left parties. The main thing dividing IU and Syriza, and uniting Podemos and Syriza, is a populist strategy leading to electoral success. Whatever the differences between Syriza and Podemos, and irrespective of the electoral results, Podemos has been the driving force behind the new alignment of the Spanish left. And this is already a great victory.